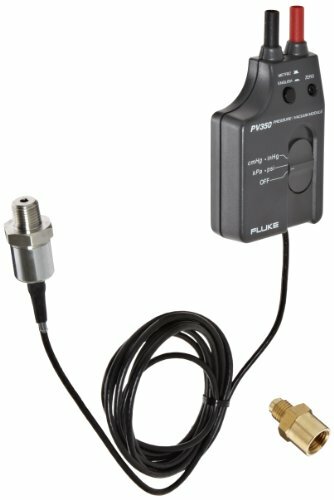 The PV350 pressure/vacuum transducer module (the module) measures gauge pressure; the difference between atmospheric (barometric) pressure and the pressure (or vacuum) applied to the pressure port on the transducer. It then converts that measurement to 1 mV dc per unit. A module and a high-performance digital multimeter (DMM) with min/max function become a data logger capable of measuring peak high and peak low. The PV350 is compatible with industrial gases and liquids that are compatible with 316 stainless steel. To determine the compatibility of a liquid or gas, refer to the manufacturer's specifications. When making measurements on more than one type of pressure system, make sure the fluids or gases in those systems are compatible. If they are not, contamination or damage to the system being measured may result. Battery: standard 9 V battery (NEDA #1604, 6F22, 006P). Battery life: 300 hours (typical) for carbon-zinc 400 hour (typical) for Alkaline. Vibration: 3 g at 55 Hz sinusoidal. Shock: 1 meter drop. Electrical cable: black PVC, will withstand up to 105 degree C. Cable length: 8'. Pressure port connection: 1/4" NPT. Connector: brass 1/4" male flare to 1/4" female pipe thread. Pressure range: 350 to 500 psig (2413 to 3447 kPa), accuracy: +/-5 percent of reading +/-1 psig typical (+/-5 percent +/-7.0 kPa) Vacuum range: 0 to 29.9" Hg (0 to 76 cm-Hg), accuracy: +/-1 percent of reading +/-0.5 in-Hg (+/-1 percent of reading +/-1.3 cm-Hg). Output: 1 mV per unit (psi, kPa, cm-Hg or in-Hg). Resolution: 0.1 psi/in-Hg in mV range, 1 psi/in-Hg in volt range with 3-1/2 or 4-digit meters. RFI Specification: Typically less than 1 percent error from 14 kHz to 30 MHz at 1 V/M. Meter input impedance: greater than or equal to 10 M ohms. Maximum working pressure: 500 psi. Burst pressure: 1000 psi. Storage temperature: -51 to 71 degree C.